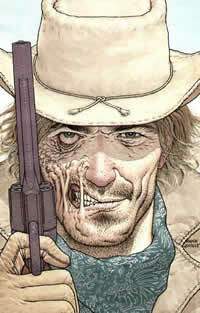 Jonah Hex, that is. Jimmy gives us the lowdown on his successful revival of the DC western hero, with co-writer Justin Grey and artist Luke Ross. We also talk about Hawkman, Daughters Of The Dragon, upcoming works like the Punisher valentine's day special, The DC post crisi mini series "The Battle For Bludhaven", The Painkiller Jane film, and have a frank discussion about sexuality in American comics.